Alexei Mordashov, owner of the Severstal steelmaking and mining group (lapel button), has instructed the executives in his goldmining arm Nord Gold to prepare for another shot at selling their shares at an initial public offering (IPO) in London before Christmas. He’s also told them that the sooner they can buy out the Canadian minority shareholders of High River Gold (HRG:CN), the sooner the IPO can go to market – and the sooner they can earn their bonuses. The news, which Severstal and Nord Gold decline to corroborate for the moment, comes from what Bloomberg terms two people familiar with the matter. In mid-January, Bloomberg reported that three underwriters – Morgan Stanley, Credit Suisse and Troika Dialog (JP Morgan and Goldman Sachs refused or were dropped) – were planning to list 25% of Nord Gold at an enterprise valuation of $4 billion, with $760 million of the proceeds to go to Mordashov, and $240 million to Nord Gold. A fortnight later, when the prospectus was released to the London market, the division of proceeds had been modified, cutting Mordashov’s take, but leaving Nord Gold with almost no cash in hand after it clears the related party loans, financings, interest charges, administrative costs, and other obligations between Nord Gold and the Severstal group. “If successful,” Bloomberg roostered, “Nord Gold’s IPO would be London’s biggest since…”— but it failed. For the reasons, here’s the full story. That’s not what minority shareholders of HRG believe in Canada, for they have organized one of the most effective internet-based campaigns ever mounted in Canada to resist Mordashov’s attempts to buy them out. He has been trying since the spring of 2009, with a first offer of 8 cents per share. He then increased this in two new offers to 22 cents and then 30 cents. By the time Nord Gold was ready for the London Stock Exchange, Mordashov’s stake in HRG amounted to 73%. Supposing that he and arms-length companies allied to him have not been able to buy more shares in the market – Canadian regulations require disclosure of stake increases of 2% or more — the resisting institutional and individual investors have hung on to around 27%. 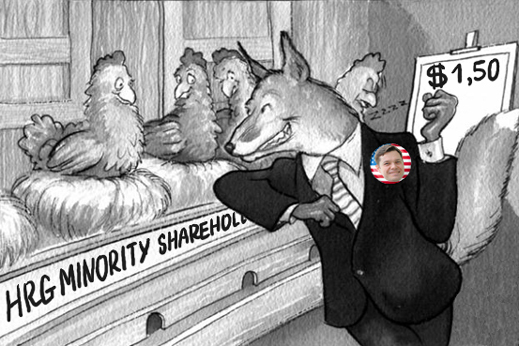 One of the resisters estimates that Mordashov must buy 147 million more HRG shares to reach the 90% threshold. At that point, Canadian stock market rules allow them to proceed with a mandatory buy-out offer to the remaining shareholders. Investment bankers told Minesite after the Nord Gold IPO was withdrawn in February that, because HRG amounts to more than half the value of Nord Gold, “they [Mordashov and Nord Gold] really need to consolidate HRG, but the minorities there are not going to give in so easily after Mordashov tried to shaft them a couple of times. Can’t do that so easily in Canada.” On the full-year results published to date, HRG amounted to 56% of Nord Gold’s gold production (589,100 troy ounces) and almost the same percentage of its revenues ($754 million). Nord Gold’s website no longer makes the January prospectus accessible. Instead, it has released its first-quarter 2011 production and financial results, claiming big gains on the first quarter of 2010. Gold production was 174,193 oz; revenues US$244 million; earnings (Ebitda) US$135.1 million; and net income US$95.6 million. But these results are not broken down to reveal how much has been contributed by HRG. The Canadian company won’t release its first-quarter results until June 14; its second-quarter results on August 15. Sources close to Mordashov and Nord Gold believe he’s agreed to offer C$1.50 per share. With the share currently trading between C$1.15 and C$1.18 – that’s a premium of 27%. In the year to date, HRG hit an offer price peak of $1.50 when there was market speculation of a successful Nord Gold IPO. It then sunk to a low of 98 cents in March. Three years ago, in 2008 before the company ran into operational and financial difficulties, and before Mordashov bought his control stake, HRG traded from a high of $3.37 and a low of 6 cents. The tale of Mordashov’s takeover, and the Canadian resistance, can be found here. It is not the only consolidation attempt Mordashov has been making to fatten Nord Gold for its second IPO try. The tale of attempts at putting the big Russian silver deposit Prognoz into bankruptcy was first told a year ago. The biggest unmined silver deposit in Russia is years away from mining – and Mordashov may transfer the financing requirement for that to the public shareholders of Nord Gold, if he can persuade them to buy into Nord Gold this year. In the meantime, his efforts to take control of the 50% stake in Prognoz he doesn’t already own has failed after a series of Russian commercial court rulings concluded on May 25. This also eliminates market uncertainty that Mordashov’s hold on his half of the Prognoz asset might slip.